The surge of domain names registration has been ongoing since the origin of the internet. Some of the first domain names registrations were created by scientific organizations. Before the internet saw www being used as a prefix for websites, the first domain name to be registered was symbolics.com in 1985. Domain names evolved into unique names that became an identity for websites. From the days of ARPANET to the advent of the new gTLDs, the world of domain names has drifted drastically. The history of domain names: In the days of network solutions, the domain name served the purpose of the host’s numerical address which began in the ARPANET era. The network of host files from each computer were mapped as numerical addresses. This soon changed in 1983, with the advent of the Domain Name System or DNS. The domain name represented the IP or the internet protocol of the host computer. Soon there were bifurcations of top level domain names or generic top level domain names and their second-level domain names. 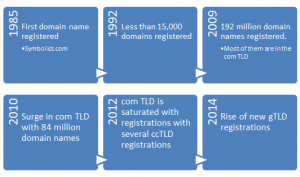 Here’s a list of the key milestones that have impacted the world of domain name registrations: Symbolics.com This TLD was registered as the first commercial internet domain name in Cambridge, Massachusetts. Since the 1980s, categorization of domain names ensued as country code top-level domains or ccTLDs which were two-letter territory identifications and seven gTLDs emerged. The latter included .com, .gov, .edu, .mil, .org, .net and .int. The right to use domain names is exercised by domain name registrars. Before the new gTLDs, there were domain names like .biz and .info that saw tremendous popularity. Apart from that, ccTLDs or country specific domain names became a rage for domain owners. In 2008, ICANN, in its 32nd International Public Meeting announced the availability of new generic top level domains. Several countries such as Palau tried to catch on the gTLD revolution. .pw is now synonymous with professional web. With timely rebranding of .pw into the professional web instead of the country’s ccTLD, the domain name is now a namespace for professional individuals and businesses. Another important domain like .co had been allocated to Columbia. Due to the similarity between .com and .co, the surge in the demand for .co domains increased, which led to the creation of the .CO Internet S.A.S. The latter undertakes the registration for .co domains around the world. The road ahead… When ICANN decided to expand new gTLDs to reduce the load on domain names like .com, there were several skeptics who believed that .com strategies would still not budge for several small and big businesses. 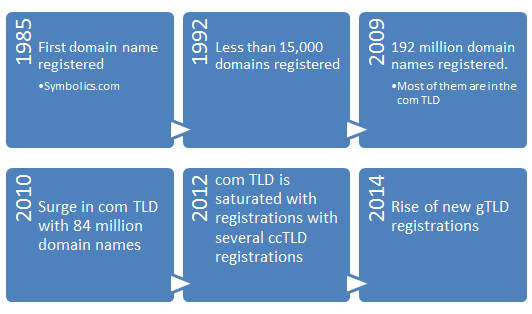 Yet, within a short time of the announcement of new gTLDs, ICANN witnessed 1930 applications for 1410 unique domain names, in 2012. Some of the applicants were large online businesses like Amazon and Google. Digital marketers caught up fast with the ongoing trend as more and more businesses including regional players joined in. Other experts believe that the year 2014, will witness large transactions in internet history in the new gTLD space which will indirectly or directly impact marketing strategies such as search engine optimization. This could also help in reaching a whole new regional audience within countries. The future of the small entrepreneur seems bright with the ability to grasp the best the internet has to offer and not necessarily be fixated to a .com name.